Yes, there are some things that are definitely a need and then there are just silly wants. This is the ongoing Saga of the hall Bathroom redo. My DH woke up with a terrible tooth ache. Turns out it is three teeth. Now we are possibly looking at extractions, root canals, crowns and implants. Does all of that say BIG DOLLARS to you. It really does to me, somewhere in the thousands. Now this is definitley a need, regardless of the $ you do NEED to get your teeth fixed, however on the WANT front, the hall bathroom just got put on the backburner sort of. 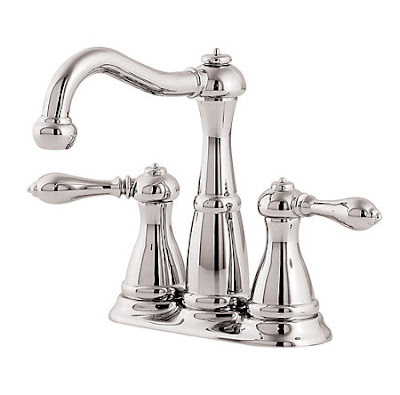 So here is where we are - - - -I already have this wonderful faucet by Pfister on the way. I love, love, love this faucet, it is so pretty. Pfister contacted me and offered to send me a faucet for my bathroom-redo. Can you believe that. I was so excited, and I can't wait for it to get here. This is just the most gorgeous faucet. This beautiful set from Restoration Hardware that I had already ordered has shipped. I fell in love with it and it was on sale at a really affordable price so I just had to have it. Now as for the saga of the mirror. You all were unamious about the scrolly one for my bathroom. I ordered it and when it came HUGE DISAPPOINTMENT. It looks rather cheap in person. The gold finish is dull and really not pretty at all. So, I sent it back and now we are back to the beginning. I also took a look at my inspiration picture and really had to finally admit that as much as I wished my house looked like this, it doesn't and it really isn't me. I am much more toned down than this. I love elegant, but maybe not quite so froo-froo. So now what can I do that is totally free just by shopping the house. I think I found a few things that will work perfectly and for free. Here is a look at the Free changes. Fabric I had leftover from the topper to the familyroom drapes, it works perfectly for the new shower curtain and goes with the current paint color beautifully. The fabric is camel and cream plaid and I used a tassel to tie it back. The mirror stays the same, but I did change out the rest of the art. Love the two paintings and the plates are always fun. Some fluffy cream and camel colored towels. I found this precious little angel print at GW a while ago, and I think it is perfect in here. 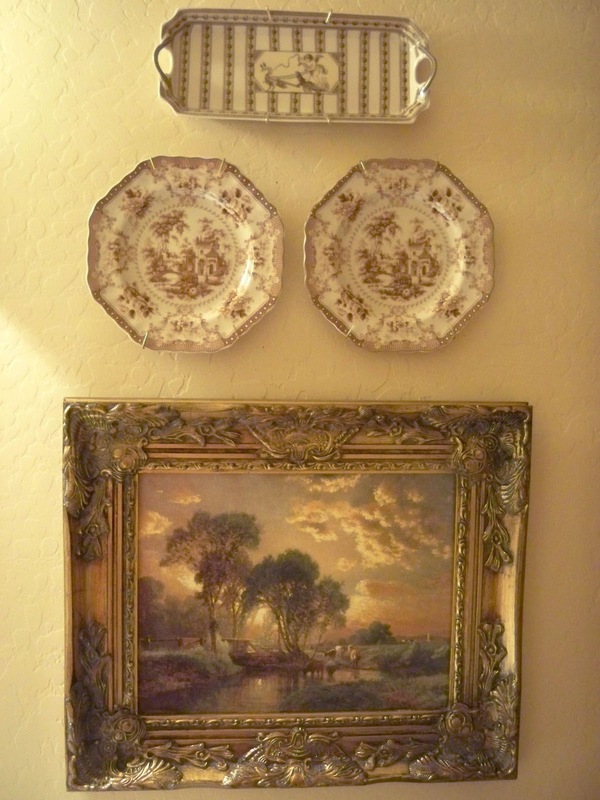 Brown transferware plates and one of my favorite paintings. It is really just a print and has nonglare glass over it, so it will stand up to any moisture in the bathroom. Such a calm and lovely pastoral scene. Yes, I really do want to replace the mirror, but for now I may just gold leaf it or something. Still need to figure that out. 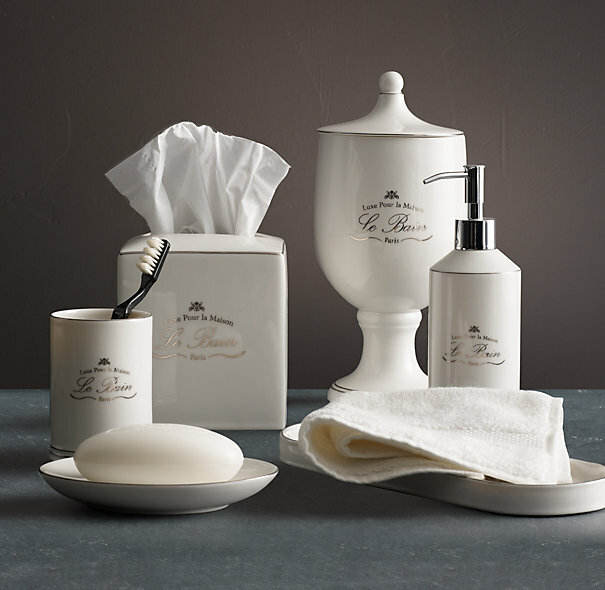 My Restoration Hardware accessories havn't arrived yet, so I borrowed these from the master bathroom just to get the feel. One thing I've had for years is this over the door towel bar. It is wonderful for guests. This is the before. The jungle has been sent back to the forest. 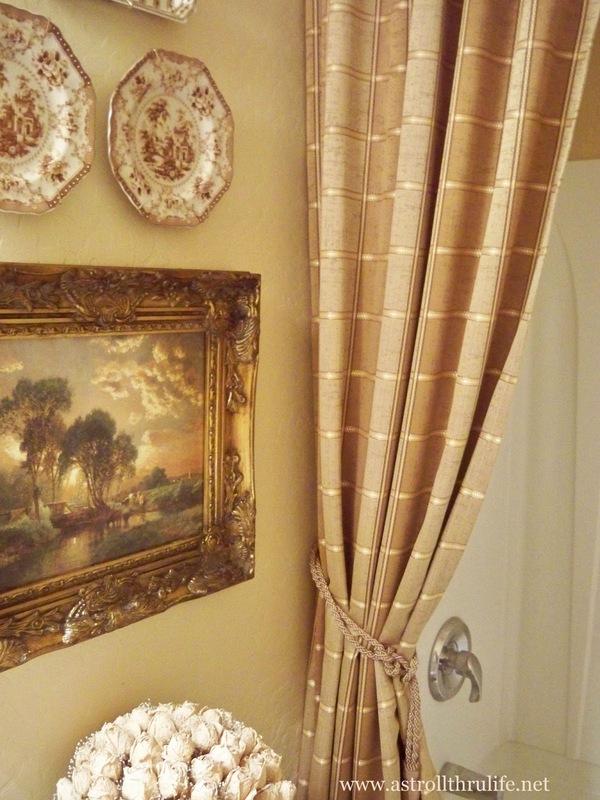 This is a shower curtain and accessories from my previous home, so I have looked at this for 12 years. I think it is definitely time for a change. See, here it was in my previous home. Everything you see here is something I already had, so free. When they get here I will add the new faucet and the new bathroom accessories and put these back in the master bath. OK, I am happy for now. Down the road I will still paint and buy a new mirror and I may still make a new shower curtain with the buffalo check. But for now, this is perfect. So, how do you handle all those needs and wants? Since Google Reader is going away on the 1st, I would love for you to follow me with one of the options below. It's REALLY amazing how much dental work costs...I don't understand why, but I feel your pain! So sorry to hear about your DH needing dental work. Uh, no fun. Your bathroom looks great and the faucet is so pretty. Iam in the process of needing to update our master bath because we're thinking about selling again. Going to cost a bunch of money that I don't want to spend. Awww, sorry that the mirror didn't work out and hubby needing dental work but on the up side the bathroom is looking good! Love the RH accessories and faucet. The bathroom is very pretty. In fact, I like your whole house! Dental work can be pricey. My husband has had some teeth basically disintegrate so we are in the same boat. I like the way you think, Marty - the bathroom is looking great. Isn't it nice to freshen up? Too bad about hubby's necessary dental bills. Life is like that. 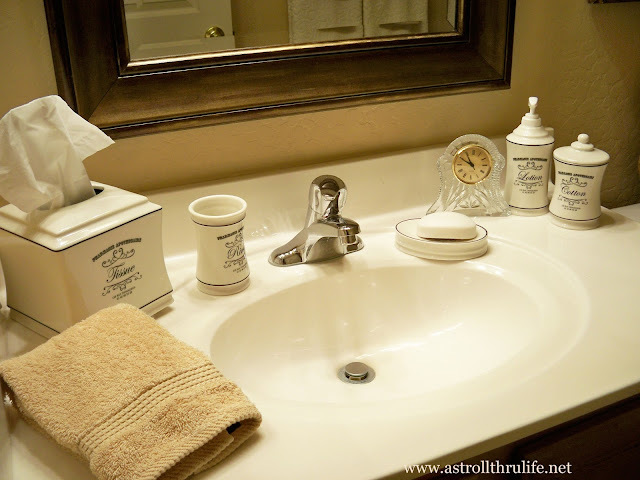 Your bathroom looks great and the Pfister faucet is going to be a wonderful addition. We just had to buy a huge new garage door and I have four bathrooms that need work. I'm going to start with paint and see how much I can improve on a tight budget this summer. I'm sorry about your hubby, anything concerning teeth is a drag and always so very painful, hope he gets over it soon! Your bathroom is looking gorgeous Marty and I too love your faucet, as I was drawn to it and immediately wanted to visit and I'm happy it's yours. Sorry about the mirror, but yes, I like elegant, but not froo-froo either! We were supposed to be remaking our bathroom, but ended up going to Florida, now it'll take a little longer to begin the job, but I am getting such great ideas from yours. Thank you so much. Enjoy your weekend. Oh how I love the colors and the plates. I love them in there. Had not thought of that. It is beautiful!! Too bad about your husband's teeth. Definitely a need and not a want! I think you did a great job shopping your house to update the bath. Love the faucet and the shower curtain. Gold-leafing the mirror is a good idea too. Oh I love the new look..and your bath accessories too. Poor Mr. I feel for him, dental work costs are ridiculous. It is perfect!! That faucet is stunning! Can't wait to see what you do for the mirror! I rather liked the mirror from the beginning. It seems more like something you would like rather than the gold one. 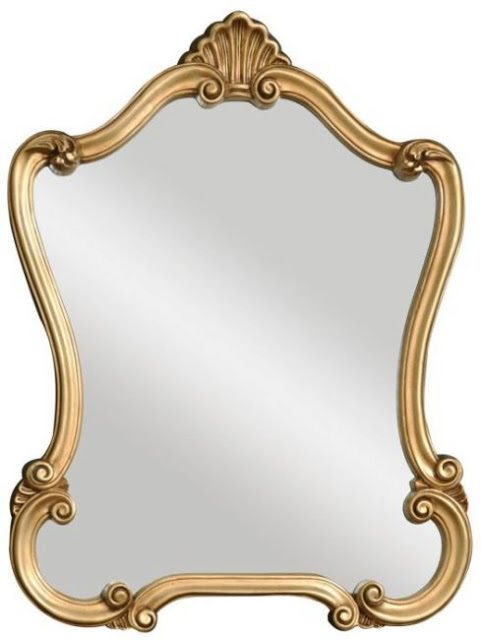 Perhaps you will eventually run into the perfect soft gold mirror.. In the meantime..I like this one..and your new decor. You may not have everything you want right now, but I sincerely think it is just lovely. I love that set you got at restoration hardware and would buy that myself. Your color choice and style are both right up my alley. 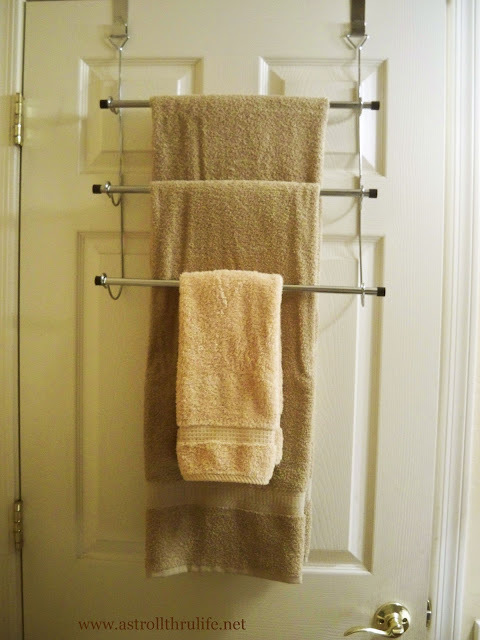 On another note: At first, I saw your towels reflected in that mirror and thought you had put a frame around a towel rack, and you know what? I thought that looked really cool. Now, I'm thinking that I want to put an empty frame around my towel rack and see how it looks! Love the updates and hope hubby feels better soon. Its hard to have those wants when the needs of the mouth are looming over our head. Did u consider painting your existing mirror? May change the whole look. Thank you for coming to visit me on my blog. Your home is so beautiful !! I love the changes. 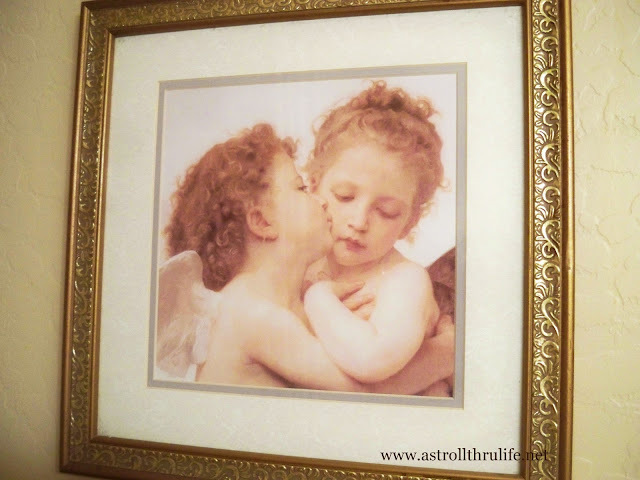 I have the same angel picture in my master bath! I'm with you, I don't usually get to extravagant with my spending. I seem to enjoy using what I have, or spending very little money on makeovers. Fabulous job as always!! It looks great Marty. It is always something that costs money isn't it? I have been wanting to get my bath redone and a new one added, I can't find a contractor that doesn't want an arm and a leg. I wish some company would let me try something for them!! I think that is such a blessing! Your bathroom turned out beautifully, and I am sure you will find that perfect mirror eventually!! I love the change and I shop the house when the budget is tight too, Marty! Now THAT truly is a pretty faucet. And I did not know that other women liked "hardware" the way I do. :) Nice to know. Sorry to her about your husband's dental problems. Boy, those can cost a small fortune ... no, make that a large fortune. Hope he is better soon, and that you can STILL get your new bathroom before too long. Have a great weekend. I like the changes you made. It's fresh and elegant. I hope your husband feels better soon. So beautiful! I love your style! I love the curtain, its colour and pattern are soothing and it works great in your room. Hello! We're new to the blogging world and are only just now discovering all these wonderful snippets of people's lives. Thank you for sharing your needs and wants...and how you walked through this! I love how you took lemons and made lemonade. The bathroom looks lovely, I especially like the set from Restoration Hardware and the plates on the wall. Great idea! So sorry to hear about hubby and the teeth. Well wishes to you both! Wonderful pictures. Love that camel fabric. It looks so pretty, Marty! 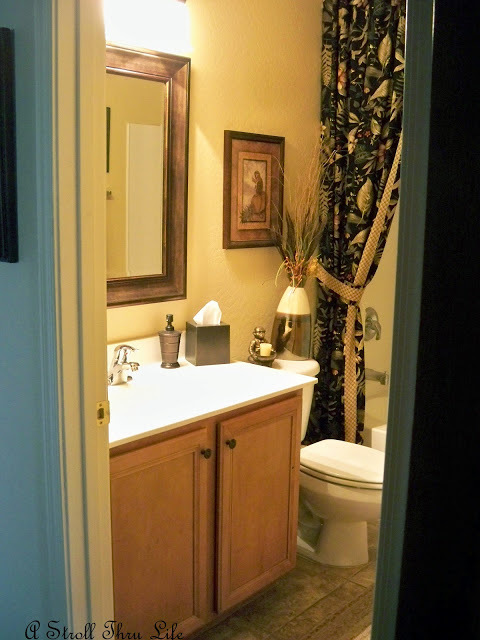 The bathroom looks calm and serene and updated. We had to have a new A/C unit installed and a leak in a pipe that was in a wall... those were indeed needs, but not how we wanted to spend our money!! I love the new look and am eager to see that beautiful faucet in there too! I laughed about the old stuff. Very funny! 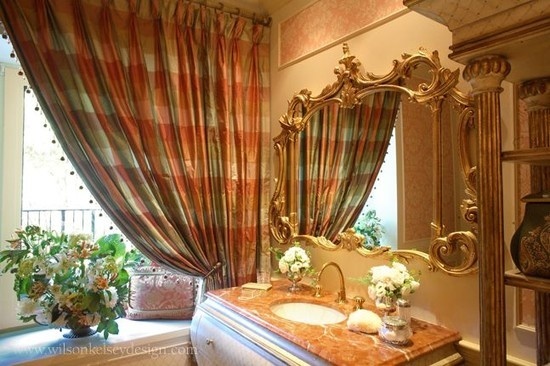 The bathroom is so pretty with so many lovely accents! Bathroom looks great. Amazing what we can come up with when necessity strikes. Honestly, I thought the inspiration photo was a little too froo-froo. Didn't seem to fit the rest of your home. 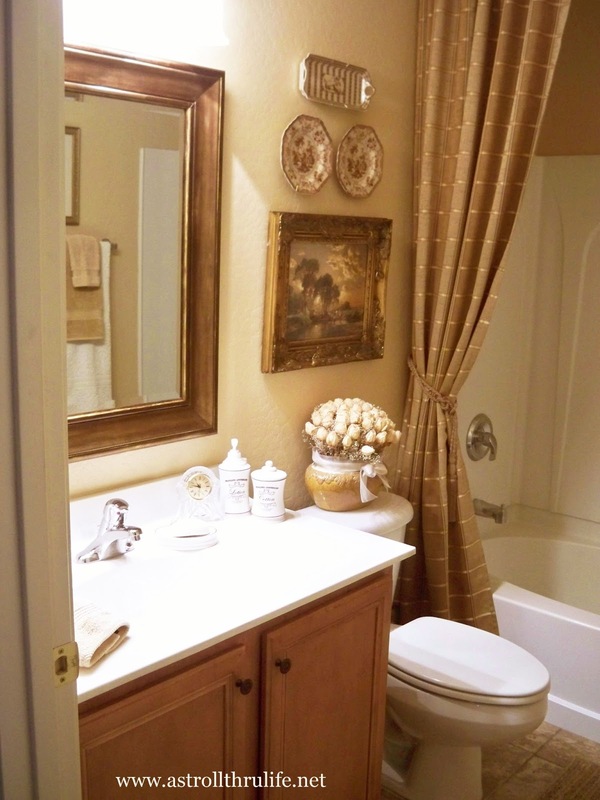 Your updated bathroom is beautiful! great job! 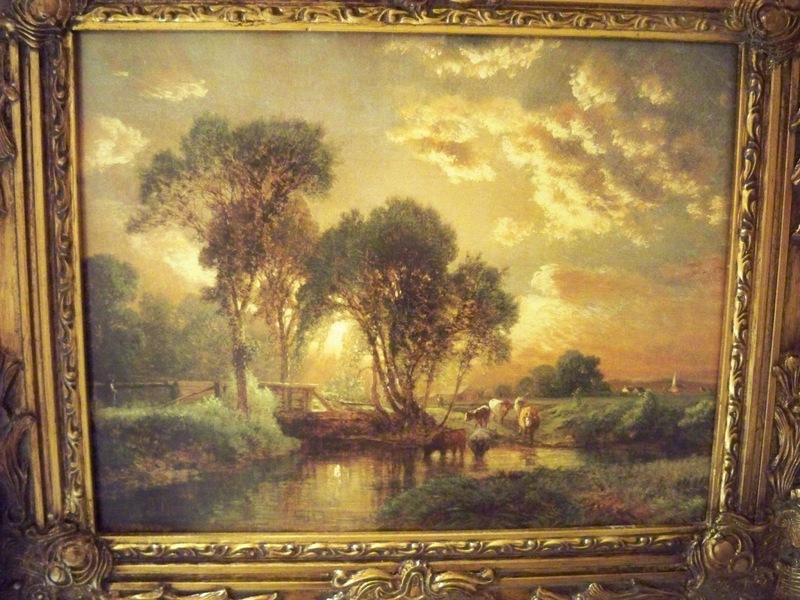 Would you share where you found that gorgeous gold frame? The gold frame is from Hobby Lobby. They carry this style all the time and I got it on their 1/2 off sale that they regularly have. It was only $20. If you buy a frame they frame your print for free, how fantastic is that. oh I love Hobby Lobby. I fell in love with the George Inness picture as soon as I saw it on your blog and the frame you chose sets it off perfectly! This really looks lovely and it's a huge change just switching out those few pieces. Wonderful job, Marty!! Honestly, how do I deal with all the needs and wants? Well, I just do with out the wants and use them for inspirations. I try to make do with what I can put together for free, and or at a very little cost. I am usually very happy with the results, too! It may take time, but I happy :) Sweet blessings to you and may your hubby get well from his teeth very quickly! Hi Marty! Oh, I love how your bathroom looks. I've said it before - you've got the touch! Thanks for popping in to see me. I've been gone for a week and will be home tomorrow. Sorry the mirror didn't work out, Marty. It looked pretty enough. I'm sure you will come up with something amazing because you've got style! So much so, that I'm changing my living room decor, which I've had for fifteen years, and I like your colour scheme. Your new bathroom faucet is gorgeous! I am looking for one too. I will be sure to keep connected with you so I will link up with Bloglovin. Have a wonderful upcoming week. I love the plate arrangement! I barely have room to turn around in my bathroom. Already looks amazing Marty, despite no mirror! Love the art work and the fabric you chose, perfect! Patience is key, the right mirror will eventually show itself, so keep the faith dear! BTW, posted the blogger series already on the Favorite art!! Thanks so much again for participating!!!!! Your bathroom looks so pretty and elegant. Very tastefully done...NOT OVER DONE. The mirror frame is pretty and I like the pastoral painting with the brown transferware. So sorry to hear your DH and his teeth trouble. Not fun!! Your bathroom is really beautiful, Marty!!! I love the soft camel color of the shower curtain. The art in that room makes it like a little museum... so elegant! First of all, I totally hear you on the saga of a bathroom reno. We started ours in October and we're still working on it! It's great when you can shop the house and find the perfect items for the room that you're working on. Your bathroom looks great! And I think the mirror looks fine - but if you want to dress it up a bit, have you though of using O'verlays? They're designed for Ikea furniture, but you could definitely use them to dress up your frame - and then maybe paint it gold. I've always been a fan of gold frames even when they weren't "in". I still love them. The transferware and the gold framed picture go so well together. Love that view from the hallway into the room. I'm so sorry to hear of your husband's dental problems....that is just awful! A toothache is no fun let alone a toothache in THREE teeth!!!! Ouch! I love the changes you have made so far and the new faucet is fabulous. Marty I l love your style, it's classic and beautiful. But I'm sorry to hear about your hubby's dental problems. Hope things get better soon. I feel your pain with your hubby’s tooth problem. Seems like every time we are ahead something happens and we are off to get a crown. You have done a great job! I really like the plates hanging from the wall. I would never have thought to put plates as decorations in the bathroom. 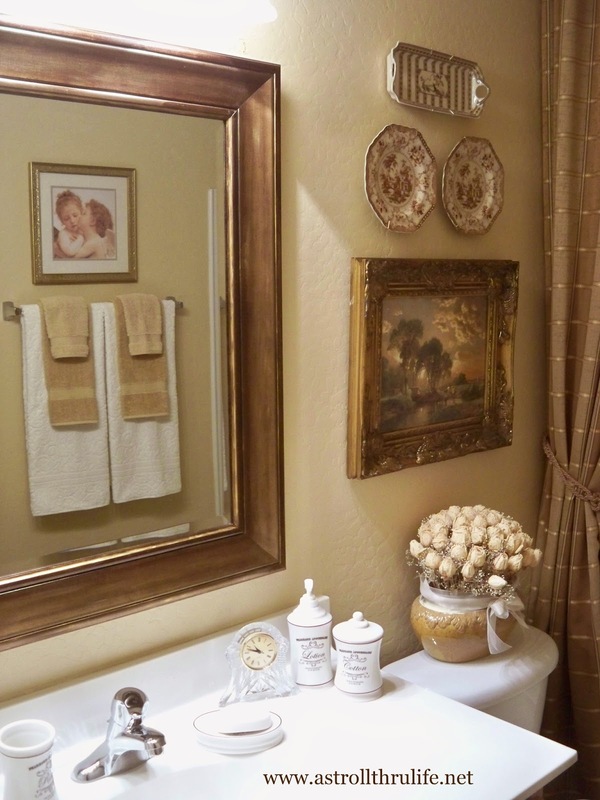 Your bathroom is so beautiful and serene. Thanks so much for linking it up to Ditto DIY! I love the transfer ware and the painting. I think you have transformed the space. I know about dental bills as my college kiddo has three cavities. Which is ridiculous. Can you believe my big Italian mirror had been in a barn and I paid ten dollars for it-maybe you can find a thrifty one too. I love all the changes you have made in your bathroom. I especially love the farm picture and the curtain tied back. So sorry about your husband and his dental issues. I feel his pain and your pocket book, as I have had extensive dental work myself. Needs must always come first. 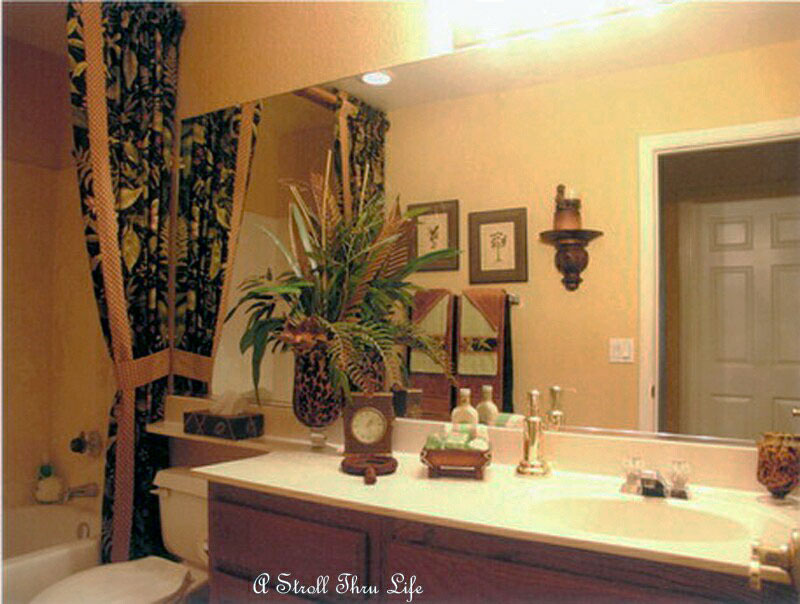 However, I think the changes you made in your bathroom look absolutely wonderful. Isn't it amazing how some fresh items and a little re-organizing can make such a wonderful difference. You did a great job. I really love the new look! the mirror looks fine to me. I love the new shower curtain and accessories! 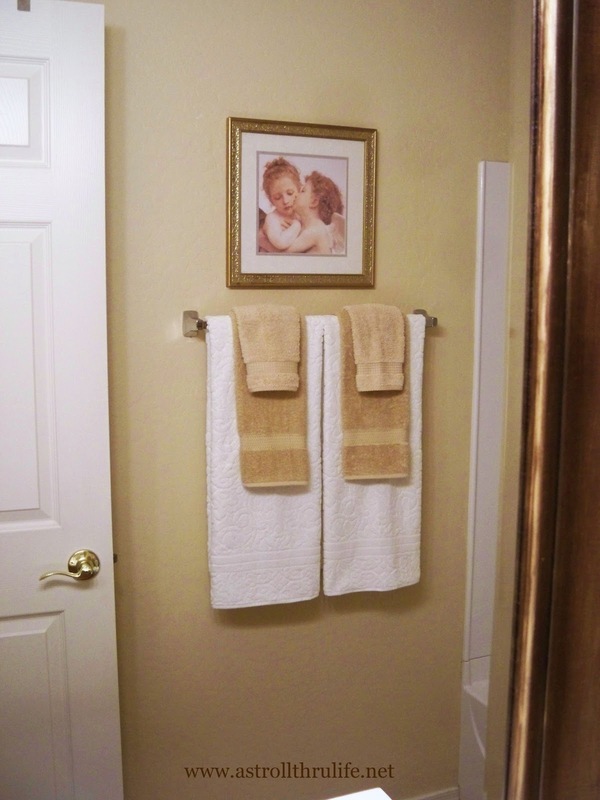 Love the little grouping above the toilket much better, and I have the same angel picture. That looks really nicethere too! Great job! I LOVE the shower curtain and the set from Restoration Hardware. Looks perfect! Thanks for sharing at Silver Pennies Sundays. Your bathroom redo is looking so pretty! You know you could've kept the mirror and just painted over the frame if that was the part that was bothering you. The shape was so pretty. You might have luck finding something at an antique mall. I see mirrors there all the time! You'd have a good chance of finding something unique there. Don't you hate it when life gets in the way of DIY projects? Either way, it's coming together beautifully! You'll find what you need and you'll make it all come together. :-) Thanks for linking up to my Project Party! That's a shame about the mirror not working out - it had such a nice shape. 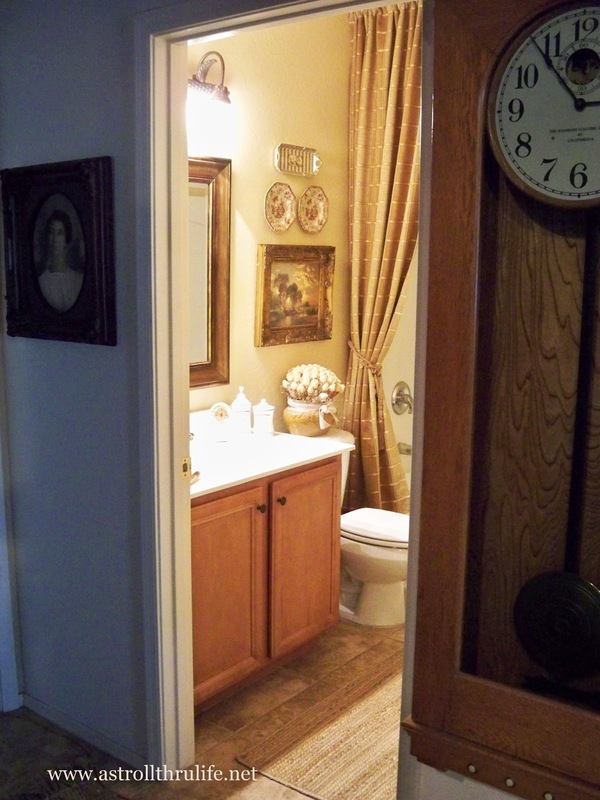 You bathroom redo looks great. I really LOVE that painting! Just gorgeous! I like the color of the curtain and the plates - very soothing. It looks really pretty! It is definitely a constant case of juggling, isn't it? But WOW! This came out wonderfully! You did a great job!!! Thanks for sharing some wonderful ideas! WOW!!! You're redo looks AMAZING!!! You could definitely be featured in a magazine. Thanks for sharing at the Creative HomeAcre Hop. Looking forward to seeing what you share this week! It looks amazing Marty! Shopping the house certainly worked out perfectly, including using the existing mirror...it really looks wonderful! Thanks so much for sharing at AMAZE ME MONDAY...you'll be featured!